This 12 year old child was suffering from severe headaches and lower back pain. He suffered constantly but was told by many doctors this this was just part of growing and was normal. He saw a chiropractor and this helped relieve the pain for couple of hours, but eventually it returned. He was also given stretches and strengthening program by a physiotherapist, which he did religiously, but felt it was actually making his condition worse. The young boy was depressed with the pain and unable to participate in any sport, however there was no injury associated with his pain. Although he had orthotics prescribed to treat the over pronation of the right foot it caused more pain in his lower back and neck. 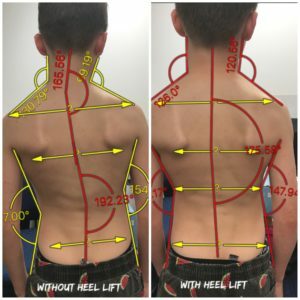 The boy had a left structural leg length difference of about 15mm (confirmed by Scanogram), a pelvis twist and lower back bending towards the longer leg (normally the lower back curves to the shorter leg), causing a scoliosis right through his spine. To fix this it was also suggested that he may need surgery to apply a bar to straighten his spine surgically. Dr. Abbie Clinics performed a biomechanical assessment using its NAS (Najjarine Assessment System) technique and found he had internal tibial torsion on the left shin (twisted inwards) and an external tibial torsion on the right shin (twisted outwards). His hip muscles were therefore compensating to the opposite affect of what the shin bones were doing. If you have a right shin bone twisted internally on the left the body, it has an amazing way to use the external hip muscles to rotate the whole leg out, causing muscles like the gluteal and piriformis to contract and cause the Iliotibial Band (ITB) to tighten, resulting in a posterior pelvic tilt. Whilst the shin bone was twisted externally on the right, the ground muscles compensated to bring the leg inwards using muscles like the hip adductors and the psoas to contract, causing an anterior pelvic tilt. The right foot wants to pronate (roll inwards) more to compensate for the left shorter leg. So if anyone tries the correct the pronation only will cause the right hip joint to jam and also the sacroiliac joint on the right. It is therefore important to always assess for leg length in a patient, right from the start. Corrected the pronation using orthotic devices with out-toe gait plates used on the left and in-toe gait plates on the right to treat internal and external shin torsion. Orthotics cannot be too soft that they bottom out and not too hard that he cannot walk in them. They must be able to reduce the amount of pronation to a required amount for shock absorption. There are approximately 28 styles is orthotic devices and about 100 different modifications, so not all orthotics are the same. There are different casting methods to make orthotics not all provide the same effect. The NAS technique takes into consideration weight, height, age, activity; the amount of individual pronation of each foot; and shoe styles as there are different orthotics for different styles of shoes. If a tree leans over a little bit you use a stick to straighten it. If a tree leans over considerably then you use a metal bar to hold it up. The same goes for orthotics if you roll in a little you use a softer version of orthotics if you roll inwards severely then you use a stronger material to correct the foot position. In this case, we used a heel lift to apply on the orthotic for the short leg. Using a heel lift alone without correcting the longer leg pronation can cause the situation to worsen. The heel lift must be done in stages to allow the muscles which have been shortened to lengthen and the muscles which have been lengthen to shorten. If you raise it too quickly it will cause patients pain. Stretches and strengthening were used in conjunction with orthotics, and the patient worked along side the physiotherapist and chiropractor with these. We believed spinal and pelvic adjustments were necessary as the patient also had a pelvic twist and scoliosis. In this case, one treatment was not enough and a multidisciplinary approach was taken. The patient is now pain-free after wearing orthotics and heel lift combined with stretches and a strengthening program via physiotherapy and chiropractic treatment.